It’s well known a Jeep is the most customizable vehicle in production. Accessories exist for all makes and models, but none more so than the Wrangler. If you want to buy an upgrade or a specialty piece, chances are, it exists. Highly specialized parts can be fabricated as well. Jeep owners are notorious for being creative and industrious, engineering innovative add-ons that have later gone into mass production. This means there are usually a wide variety of options available for practical as well as cosmetic upgrades. One of the most common and visible upgrades is a beefed-up bumper and winch combination. Whether rock climbing or mudding, a winch can become your best friend. A good winch can get your rig out of a plethora of compromising situations, or it can rescue someone else stranded on the trail. Running into any number of hazards or situations when facing rough terrain means you’ll need protection and a way to get back down the trail. Whether you’re just getting into off-roading or you’re looking to upgrade your Wrangler with extra protection, a winch/bumper combo kit is the smart way to go. Kits typically include the winch you’ll need to handle recovery, as well as protection when faced with boulders, rocks, and trees, in one all-inclusive package. Most kits will include the mounting plate, installation hardware (including “D” rings for the bumper), wiring package, rope or cable, and winch cover. Look for superior front-end protection that boasts durability with quality plate steel of 3/16 or better, and a reinforced hoop over the bumper frame for dependable protection. The entire bumper may be covered in a variety of finishes but consider a tough powder coat finish designed to prevent corrosion and rust for exceptional protection and style. To finish off your package, go for overall protection like Polyurethane resin to resist chemical, oil and abrasions for reliable function through the dirtiest adventures. Look for a winch with 3,000 lb.-17,500 lb. capability driven by a power-appropriate motor and a durable gearbox with an impressive gear ratio for maximum pulling performance. Almost as important as the motor power and gear ratios, is a winch that comes equipped with a cable or tough rope designed to handle your most difficult recovery situations. If keeping the weight of your rig to a minimum is a priority to you, opt for rope over cable. Note: Motor power and gear specs will vary depending on the manufacturer and your individual needs. Know what you want to do with your Jeep and what you need a winch to do for you before you buy. Many new winches install easily to a mount and bumper. Once the winch and mounting plate are connected, it then installs directly to your JK or JL’s frame horns without drilling or modification. It comes with a standard measure fairlead, all the necessary hardware, as well as wiring components to make upgrading your Jeep simple and easy (relatively speaking). Install on Friday night and be out 4-wheeling on Saturday morning. To ensure quality craftsmanship and performance of your equipment, request a copy of the warranty and read it carefully. If exclusions apply to the warranty statements, contact the manufacturer or reseller for complete details before you make your purchase to ensure you’re covered in any eventuality you may find yourself in down the road. There are plenty of combo kits to choose from no matter the year of your Jeep, but its year may have an impact on your options. This will be most visible in how and where the winch plate mounts to the bumper. In ‘07 -’18 Jeeps, look for the plate to match typical dimensions on the bumper of a 10" x 4.5" mounting bolt and 10" on center fairlead bolt pattern. Regardless of industry standards, be sure to double check all measurements before you purchase. Bonus Tip: Bumpers and/or winches for ‘07 – ‘18 Wranglers come equipped with tabs for mounting up to four auxiliary lights or two lights and an additional light bar. Be sure to look into these options as you never know when you may want or need lighting while 4-wheeling or working with your winch. Besides, they just look cool. 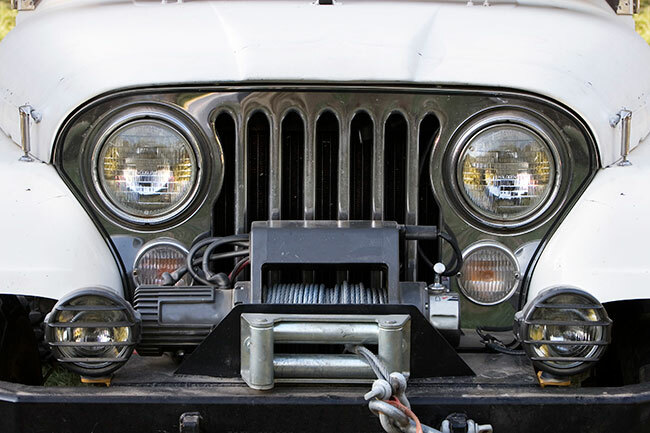 Adding a winch and/or upgrading a bumper can add life and versatility to your Jeep which, as we all know, will only increase your already strong future resale value and the quality of excursions while you own your Jeep.